UNSD Millennium Development Goals Indicators database (see http://mdgs.un.org/unsd/mdg/Data.aspx). United Nations, Department of Economic and Social Affairs, Population Division, World Population Prospects: The 2008 Revision, New York, 2009 (advanced Excel tables). For Denmark, the data cover the mainland of Denmark, Faeroe Islands and Greenland. CO2 emission sources include emissions from energy industry, from transport, from fuel combustion in industry, services, households, etc. and industrial processes, such as the production of cement. Changes in how land is used can also result in the emission of CO2, or in the removal of CO2 from the atmosphere. However, as there is not yet an agreed method for estimating this, it is not included in the figures for CO2 emissions. Burning of biomass such as wood and straw also emits CO2; however, unless there has been a change in land use, it is considered that CO2 emitted from biomass is removed from the air by new growth, and therefore it should not included in the total for CO2. CO2 emissions per capita and CO2 emissions per km2 are calculated by UNSD. For Annex 1 countries, data originally come from UNFCCC. UNFCCC has developed standardised methods for calculating CO2 emissions, which are widely used. 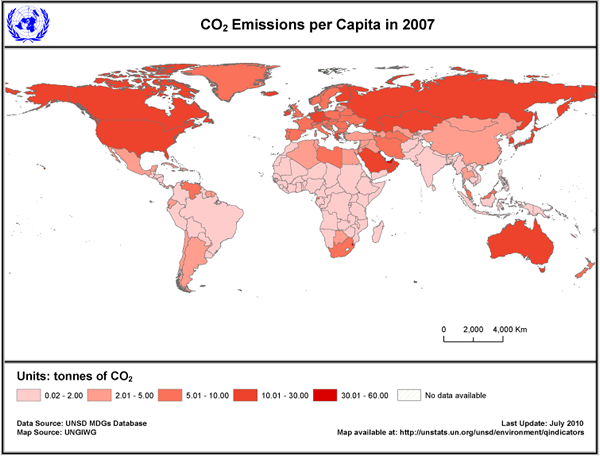 For non-Annex 1 countries, data are from estimates of CO2 emissions made by the Carbon Dioxide Information Analysis Center (CDIAC) (see: http://cdiac.ornl.gov/). CDIAC acquires or compiles, quality assures, documents, archives, and distributes data and other information concerning carbon dioxide.